It meant so much to Geraldine and Gerry when Jimmy and Sandra joined with them in setting up the Fund. 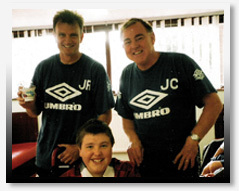 Christopher first met Jimmy in 1996 at the Manchester United Training Ground – The Cliff. Jimmy was an assistant physio at United. He was part of the famous youth team of 1992 and also the treble team in 1999. Jimmy helped make Christopher’s last five years very special. He invited Christopher back to The Cliff in 1997 and then to the new training ground at Carrington in 2000. On each visit Christopher met all the United players. Jimmy also sent him many items and photos signed by the players. He retired in 2002 after 28 years at United. “I remember clearly the day when I picked up the ringing payphone at the Manchester United Training Ground at The Cliff and first encountered the McCollum spirit. Gerry was on the phone telling me about his son Christopher, his condition and his passion for Manchester United. It had been arranged that Lee Sharpe would show the McCollums around the Cliff and hopefully they would meet the players. Unfortunately Lee had just left the Club. I showed the family around and there began a close friendship and an understanding of the needs of a young person with Muscular Dystrophy. 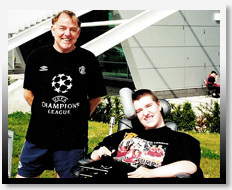 Manchester United mattered hugely to Christopher and I was pleased to be able to bring some joy to his life by sending him items and signed photos during my time with the first team.